Snap-on Smile's unique, proprietary formula of hi-tech dental resin makes it very thin yet extremely strong. It fits right over your own teeth to give you a beautiful, natural looking smile—even if you have stains, chips, gaps or missing teeth. At your first visit, Dr. Yossi will examine your teeth, decide if you are a candidate for Snap-on Smile and, if so, discuss whether you wish to have Snap-On Smile for your upper or lower arch. Dr. Yossi will then take an impression of your teeth. Don't worry . . . there is no pain, no shots and no drilling involved! Since each Snap-On Smile is custom made, the dentist will send your impression to the studio to have yours made just for you. At your second visit approximately 3 weeks later, Dr. Yossi will fit your Snap-On Smile and make any minor adjustments needed. You'll then be shown how to pop your new smile in and out, plus how to keep it looking good. 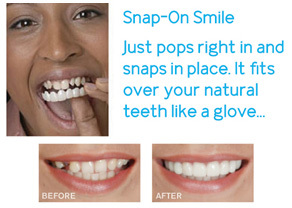 Contact us for more information about Snap-On Smile.